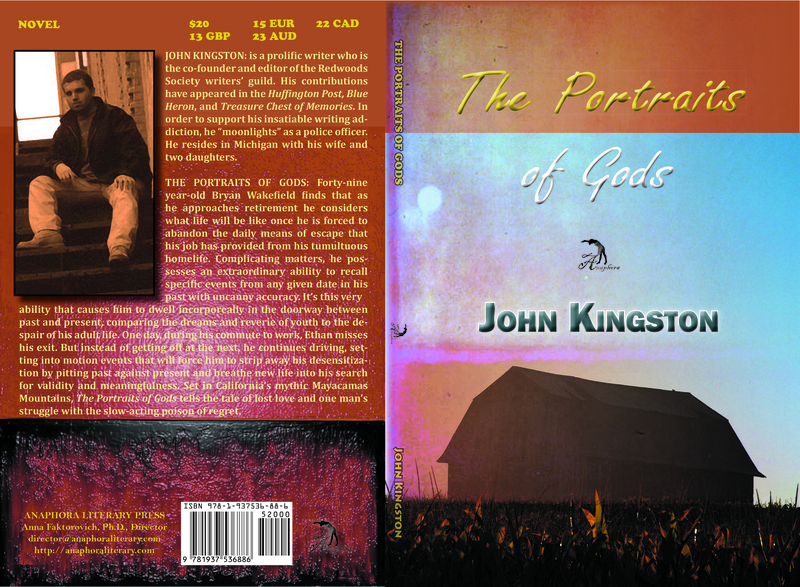 The Portraits of Gods ($20, ISBN: 978-1-937536-88-6, Hardcover ISBN: 978-1-68114-122-0, LCCN: 2014951290, 6X9”, 174pp, January 2015; Purchase print copies on Amazon or Barnes and Noble, or as a Kindle for $2.99): Forty-nine year-old Bryan Wakefield finds that as he approaches retirement he considers what life will be like once he is forced to abandon the daily means of escape that his job has provided from his tumultuous home life. Complicating matters, he possesses an extraordinary ability to recall specific events from any given date in his past with uncanny accuracy. It’s this very ability that causes him to dwell incorporeally in the doorway between past and present, comparing the dreams and reverie of youth to the despair of his adult life. One day, during his commute to work, Bryan misses his exit. But instead of getting off at the next, he continues driving, setting into motion events that will force him to strip away his desensitization by pitting past against present and breathe new life into his search for validity and meaningfulness. Set in California’s mythic Mayacamas Mountains, The Portraits of Gods tells the tale of lost love and one man’s struggle with the slow-acting poison of regret. John Kingston: is a prolific writer who is the co-founder and editor of the Redwoods Society writers’ guild. His contributions have appeared in the Huffington Post, Blue Heron, and Treasure Chest of Memories. In order to support his insatiable writing addiction, he “moonlights” as a police officer. He resides in Michigan with his wife and two daughters.